How can the concept of Russian hybrid warfare best be understood? What forms might Russian hybrid warfare in the Baltics take? What are the major vulnerabilities of the Baltic states to Russia? How can the United States, NATO, and the Baltic states deter and defend against Russian hybrid aggression? The term hybrid warfare has no consistent definition but generally refers to deniable and covert actions, supported by the threat or use of conventional and/or nuclear forces, to influence the domestic politics of target countries. Potential Russian hybrid aggression in the Baltics can be divided into three categories: nonviolent subversion, covert violent actions, and conventional warfare supported by subversion. Given the gains in standard of living and increasing integration of many Russian speakers in the Baltics, Russia will likely have difficulty using nonviolent tactics to destabilize these countries. Russian covert violent action is also unlikely to succeed on its own, given preparations by the security forces of Estonia and Latvia. The main vulnerability of the Baltics therefore lies in Russia's local conventional superiority: A large-scale conventional Russian incursion into the Baltics, legitimized and supported by political subversion, would rapidly overwhelm NATO forces currently postured in the region. The United States and NATO should pursue the development of a more sophisticated and subtle strategic communication campaign, beginning with support for Russian-language television stations backed by the Baltic country governments. NATO should do more to strengthen the Baltic countries' security forces and thereby reduce the potential for Russian covert action. The United States and NATO should take action to mitigate the risks that a NATO deployment in the Baltics will increase the potential for low-level Russian aggression. To this end, the United States and NATO should avoid basing forces in Russian-dominated areas, should consider measures to increase transparency or avoid the perception that deployed forces may be used to pursue regime change, and should develop a sound public relations campaign to convince local Russian speakers that NATO is not deploying forces against them. The research described in this report was was sponsored by the Director, Plans, Programs, and Analyses, Headquarters United States Air Forces, Europe and conducted within the Strategy and Doctrine Program of RAND Project AIR FORCE. 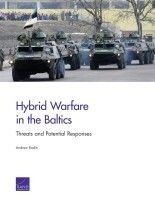 Radin, Andrew, Hybrid Warfare in the Baltics: Threats and Potential Responses. Santa Monica, CA: RAND Corporation, 2017. https://www.rand.org/pubs/research_reports/RR1577.html. Also available in print form.